So, you want to create your own city guide but you don’t know where to start. By creating your own city guide, you are giving travelers the opportunity to become a local while they explore all your city has to offer. Your city guide app can become the go-to tour guide that tourists keep in their back pocket. But how do you turn your idea into reality? The best way to create a great city guide is by focusing on these three areas: Content, Research, and Photos. Here a few things to remember while creating the perfect city guide. When choosing your topic, make sure it is interesting and that people want it. Don’t create your city guide around local tea shops if there are only two in your town. Find a subject that has a lot of content in it, like hiking trails and walking paths, wineries & vineyards, museums and art galleries. City guides that encourage visitors to explore win! Next, add tips and trivia that only a locals would know to make your app more appealing. Travelers want to get away from the crowds of tourists and your app will give them that opportunity. When creating your content you want to be meticulously organized. Separate your content into categories and then subcategories that make sense. You want your app users to be able to find everything without a problem. The key is to make your city guide easy to navigate and intuitive to your users. When you organize your content into categories and subcategories, be sure they make sense. Always start broad in topic and then narrow in. Foe example, start by making broad categories such as Restaurants, Lodging, and Shopping. From here you can create specific subcategories which go into further detail. You can then get even more specific when add your listings into each of these categories. Once you get into a routine of finding and organizing great content for your local city guide app, you won’t want to stop, so keep going until you’ve covered all the bases. App consumers will be very impressed with the high-quality information your app holds, and you might even want to consider selling some information as in-app purchases. Once you’ve chosen your topic, it’s time to jump into research. It may seem like a lot of work at first, but you can do it! When it comes to research, you need to pick out the most interesting facts and only the most interesting. Your app consumers want quick information at their fingertips, and that’s what you need to give them. Your job is to be the guide, so that means doing the required research to keep your users on track. When doing your research, double check to make sure that your information is correct. Also, check outside sources to make sure that all information is consistent. Sometimes this might require a phone call to business to inquire about summer or holiday hours. Often times, local business owners become overwhelmed with their day-to-day work and forget to keep their websites up-to-date. Finally, make sure to include all essential contact information, addresses, directions and details that help your app users in making the most of your guide. 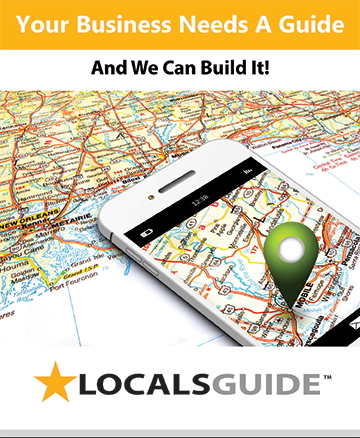 If you feel inspired, take your app a step further and include a selection of great local tips. Local Guide Tip: Consider renting a moped to get downtown. Traffic can be heavy and parking difficult. Local Guide Tip: This cafe tends to be a favorite of local school students. Going in the early morning is the best time to frequent if you are wanting to enjoy a quiet cup of coffee. You want to include the types of things that only a local would know. Draw from your own experience or talk to other locals to get great ideas. Government and nonprofit websites are a great resource for finding local guide information. Most government information is public domain, so you can use it freely. Read through their websites and collect the most interesting facts. These websites usually have great tips and trivia questions. If your app is on wildlife and you are having a hard time finding information, Wikipedia works for basic descriptions and behaviors. If you’re doing a birding app, you could research local birding resorts or talk to birders in your area. Photos are going to make your app stand out from the others. 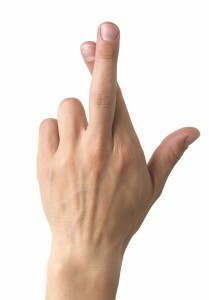 Therefore you want to be very particular about what photos you use. If you have specific shots in mind or you don’t want to pay for photos, we recommend that you take the photos yourself. However, if you don’t have the right camera or the necessary skills, consider hiring a photographer or buying photos off the Internet. You can find good deals on stock photo websites, and you can use most pictures off of government websites without having to pay. Consider taking the photos yourself, if you have the means. This will be more cost-effective and way more fun. Another option is to connect with your community and find locals who have photos they’re willing to donate or sell for a reasonable price. Once you’ve collected your photos, be sure that they are of the highest quality possible. Otherwise the photos will come out pixelated or squashed, which looks very unprofessional. Remember, you want your app to stand out, so keep that in mind when you choose your photos. Pick pictures that are professional and appealing; you want consumers to be drawn into your app and the photos you choose will help. With the right amount of planning and hard work, you can create the perfect city guide for your town or city. If have any questions, please post them below. Sign up for our free 16 day e-course. 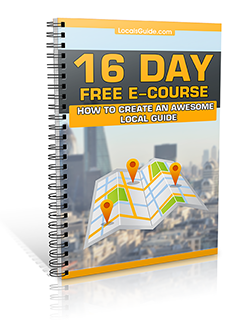 How To Create an Awesome City Guide and receive even more tips and tricks on how to create great guides!